The Holy Martyr Terence and his companions suffered under the emperor Decius (249-251). The emperor issued an edict, which commanded all subjects to offer sacrifice to the pagan idols. and he asked, how they as rational people, could confess as God, One Who was crucified by the Jews as a malefactor. In answer to this, Saint Terence boldly answered, that their belief was in the Saviour, Who voluntarily endured death on the Cross and on the third day was resurrected. Fortunatian perceived, that Terence by his example inspired the others, and so he gave orders to isolate him in prison together with his three closest companions -- Africanus, Maximus and Pompius. The remainder of the martyrs -- which included Xenon, Alexander and Theodore, Fortunatian resolved to force into renouncing Christ. But neither threats nor terrible tortures could sway the holy martyrs: they burned at them with red-hot iron, they poured vinegar on the wounds, they sprinkled on salt, they tore at them with iron claws. In spite of their sufferings, the saints did not weaken in their confession of Christ, and the Lord gave them strength. Forunatian gave orders to lead the martyrs into the pagan temple and still yet another time he urged them to offer sacrifice to the idols. The valiant warriors of Christ cried out to God: "O God All-Powerful, having once poured out fire on Sodom for its iniquity, destroy now this impious temple of idolatry, on account of Thine Truth". The idols fell down with a crash and a smash, and then all the temple was in ruins. The enraged governor gave orders to execute them; and the martyrs, glorifying God, put their necks beneathe the sword of the executioner. After the execution of the 36 martyrs, Fortunatian summoned before him Terence, Maximus, Africanus and Pompius, pointed out to them the executed and again urged them to offer sacrifice to the idols. The martyrs refused. The governor put heavy chains on them and gave orders to starve them to death in prison. by night an Angel of the Lord took the chains off the martyrs and fed them. In the morning the guards found the saints cheerful and strong. Then Fortunatian ordered sorcerers and conjurers to carry into the prison snakes and all kinds of viprous creatures. The guards through an opening in the prison ceiling glanced down into the jail-cell and saw the martyrs unharmed, praying, and the snakes crawling at their feet. When the snake-charmers in obeying the order opened the door of the prison-cell, the snakes disregarded the charms and struck and began to bite them. The furious Fortunatian gave orders to behead the holy martyrs. Christians took up their holy bodies and buried them with reverence outside the city. 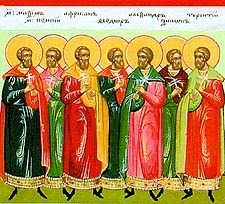 The Holy Martyrs James the Presbyter and the deacons Hazadanes and Habdikies died in Persia under the emperor Sapor in about the year 380. They were arrested together with Bishop Akepsim (Comm. 3 November). After long exhaustion from hunger in prison they inserted into the nostrils of the sufferers mustard with vinegar, and stripping them down led them out all night into the frost. In the morning, after new torments, they again locked them into prison and there beheaded them. The Holy Kvabtakheuia Martyrs suffered during one of the devastating incursions into Gruzia of a Mongol horde led by Tamerlane in 1386 at the Kvabtakheuia monastery (founded at the end of the V Century, restored in 1119 by the Georgian emperor Saint David III the Builder). Bursting onto Kartli (central part of Gruzia), the army of Tamerlane ravaged all the land and seized hold of the Kvabtakheuia monastery, within the walls of which were hidden the inhabitants of the surrounding villages. After the pillaging of the monastery, the war-lord Tamerlane gathered together the monks, and wanting to humiliate and laugh at them, he forced them to sing and dance. "Woe to us monks", -- with tears and wailing answered the monks. The soldiers of Tamerlane led them off to the cathedral church of the MostHoly Mother of God, filled with captive Christians, and covering the church with fire-wood they set it afire. Thus did the holy confessors suffer and receive the martyr's crown. Later on the blood-stains of those innocently murdered indelibly marked the walls of the church, and it was possible to be clearly seen even still at the end of the XIX Century. Sacredly honouring the memory of the men and women martyrs, pilgrims at the entrance of the Kvabtakheuia monastery still remove their shoes as ordered of old. The Holy Martyr Dimos (Demos) was a fisherman. Because of very onerous conditions he refused to work for the Turkish owner employing him at Smyrna in the fish-business. The nasty Turk slandered Saint Dimos, saying that he had expressed a desire to accept Islam. Saint Dimos renounced this false charge and confessed himself a Christian. They locked him up in prison. While in heavy stocks for breaking his will they beat him with bricks and other sharp objects. After the execution of the martyr (+ 10 April 1763) Christians gathered up his holy remains and reverently buried them in the church of Saint George.